When your friends come home from a trip to Italy, what do they rave about the most? Most likely it will be the food and even more likely, the gelato. Italian ice cream, called gelato, is acknowledged by many experts to be the best ice cream in the world. Gelato is not really the same as ice cream, however, because it has a lower percentage of fat than ice cream and has less air in it since it's churned more slowly, giving it a richer texture. Especially in the warmer months, gelato is everywhere in Italy. No snack bar or simple eatery in Italy lacks for the cheerful, refrigerated gelato case, either selling pre-packaged ice cream bars (usually quite good) or hand-scooped gelato from tubs. An ice cream shop, called a gelateria, often sells gelato made in-house and may make a variety of special ice cream dishes such as sundaes. Some gelateria act like old-fashioned ice cream parlors, where you can order from a menu and sit down to eat. Others are small hole-in-the-wall places where you order your gelato to-go and eat it while strolling. Remember, you will usually pay more to sit down and eat your ice cream, especially in larger cities. You'll want to look for signs proclaiming gelato fatto en casa (homemade), produzione propia (our own production), or artiginale (artisanal). These signal a higher quality of ingredients and finished product. Here's a tip for finding a good gelato shop—look at the pistachio flavor. If the color looks like a very artificial bright green, it's probably not a good place to eat at. Flavors should resemble the actual food from which they are made, so avoid brightly colored gelato that's piled high to impress you. If you don't speak Italian, don't worry. Often the placards naming the gelato include pictures of the main ingredients, so you should be able to figure out what they are. Point to what you want if you have to. If you can't decide what flavor to try, try several; even on a small cone, you can usually choose two flavors. You'll have to specify if you want a cone (cono) or a cup (coppa). 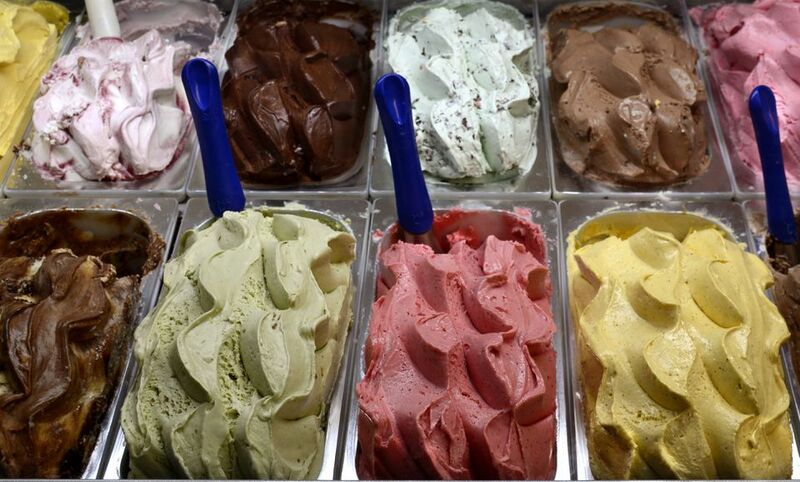 Gelato is priced by the size of the cup or cone, or by how many flavors you select. The fruit flavors, made with real fruit, are especially refreshing in summer. Limone (lemon) and fragola (strawberry) are among the most popular flavors in all of Italy. These days you'll also find more creative flavors in some shops, especially in big cities, using ingredients such as basil, ginger, or cinnamon, or even making savory instead of sweet gelato. Some gelato shops also offer soy milk gelato or yogurt. Do you want to learn more about gelato while you're in Italy? In Florence, you can take a pizza and gelato class or gelato and vino tasting, both available to book through Select Italy. Near Venice, Mama Isa offers an artisan gelato making class. Food tours, such as Eating Italy Food Tours in Rome or with The Roman Foodie, include a stop at a favorite gelateria. What Films Should You Watch to Get in the Mood for Italy?